1 Get your pan and make sure it’s nice and hot. Toss in the butter with a little bit of oil to prevent the butter from burning then throw in the onions, garlic and ginger. Cook this until you can smell the lovely aroma from the vegetables. 2 Add the chicken breast and sauté for 2 minutes before pouring in the Knorr Ginataang Gulay Sitaw at Kalabasa Recipe Mix diluted in 1 1/2 cups of water. Bring that to a boil before throwing in the chilis. Cook this to a simmer over low heat until the sauce is thick and the chicken is cooked through. 3 For that added flavour, sprinkle some patis to taste. 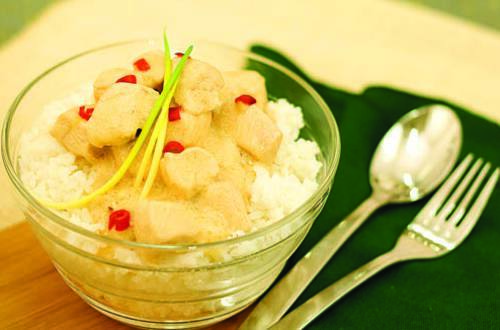 4 Over hot rice, enjoy this Halang-Halang recipe with the family. It will definitely merit a two thumbs up review for sure!